I've been in denial about the rapid approach of Christmas, but now that November is upon us, it is probably time to stop procrastinating. If you're in the same position, these four cute and easy little patterns that I've published over the last few years might help to get you in the mood! If you're not quite ready yet, I've included the Ravelry page links so you can add these to your queue or favourite them for later. This little Googly Santa decoration was made for Black Sheep Wools back in 2013 and was one of my first patterns to be published elsewhere. You can download the PDF here and add your project to Ravelry here. Leftover DK yarn in red and white will do, as you only need a little. I used a tiny bit of tinsel yarn for the beard, but you could also use actual tinsel! Hang him on your tree or use him as an extra special gift tag. 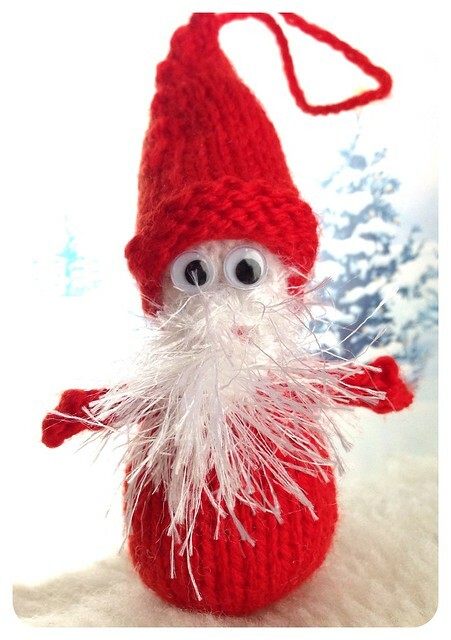 This little snowman accompanied Googly Santa and was also made from a small quantity of DK yarn. As well as being cute and customisable (use the same colour as your favourite team, or to match handknit Chrstimas gifts...) he knits up in no time. Download the PDF here and find the Ravelry page here. 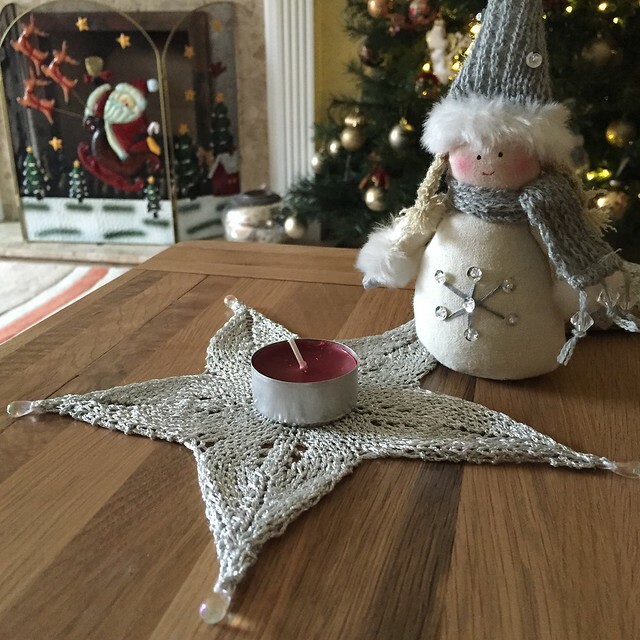 In 2014 I took part in the Scheepjes Christmas Blog hop and came up with this little twinkly Knitted Star Motif pattern - what you do with it is up to you. I put beads on the ends of mine and use it as a festive coaster, but I saw that other people have stiffened theirs and added them to their tree or used them as wall decorations. You could even make a load of them and sew them together. Find the pattern here, and the Ravelry page here. 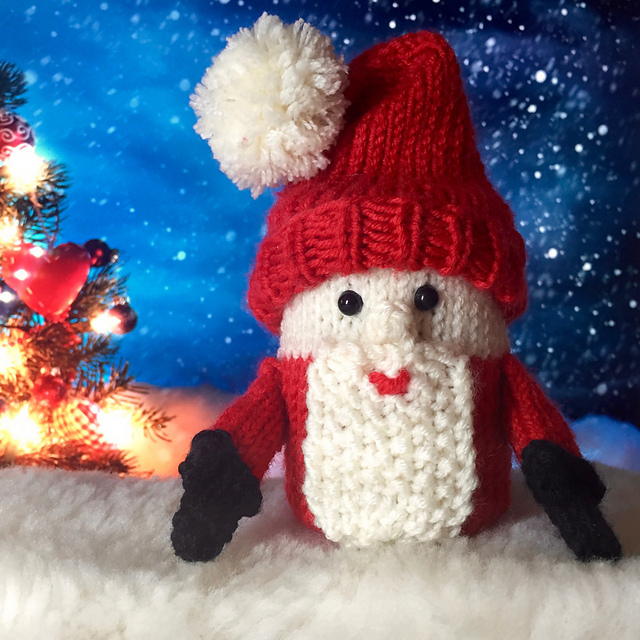 Last year, there was another Scheepjes Blog Hop and I decided to make a different type of Santa - a Secret Surprise Santa! What's the surprise? Well, that's up to you but it's under his hat! See more and find the free pattern here or visit the Ravelry page here. I'm planning another little festive freebie this year, but it's not ready yet. You'll have to check back again soon. Follow CftC on Instagram, Facebook and Bloglovin' so you don't miss a thing.